I'M looking at bee-keeping sometime soon. After several years of reading about and listening to keen apiarists talk about the highs and lows of bees, I think now is a be a good time to stop talking and start walking. In the latest Weekly Times there's a good little article on an Ocean Grove chap whose taken the leap - inspiring stuff. Now I have to join the local bee-keeping society and start the process. 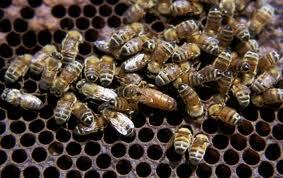 Be aware of the use of pesticides in your garden as many can harm bees.